To ask Bianca Sommerland questions, please sign up. OMG!! Just finished reading the last in the series of Dartmouth Cobras. I was hooked from the first book and had to get them all and read them in succession!! When are more coming, I can't wait, so anxious, please say there will be more, so many characters to cover and find out their hidden stories. LOVE THEM COBRAS. Please say more are coming?? I'm so happy to hear that you've enjoyed the series! At this point, I see no end in sight for the Cobras and I have planned up to at least…moreHey Trudy! Thanks for the question and happy reading! Are we ever going to see the sequel to Collateral Damage or have you abandoned that series ? Thank you for the question! :) The last book in the Deadly Captive trilogy is in the works. I haven't set a release date since I want to make…moreHi Susie! Thank you for the question! :) The last book in the Deadly Captive trilogy is in the works. I haven't set a release date since I want to make sure it's not rushed, but I am hoping to release it soon. Head to my patreon now for the next chapter of Neutral Zone Trap! Here's a little teaser. Happy Reading! We’d love your help. Let us know what’s wrong with this preview of Bring Me to Life by Scarlett Parrish. For the longest time, I couldn’t get into vampire romance. There was something missing with the characters, a depth lacking in the worldbuilding. Then I picked up Scarlett Parrish’s Life & Death series and was instantly hooked. The author's voice For the longest time, I couldn’t get into vampire romance. There was something missing with the characters, a depth lacking in the worldbuilding. Then I picked up Scarlett Parrish’s Life & Death series and was instantly hooked. The author's voice is so refreshing, the characters feel real, and the mythology of the vampires has me eager for a whole series so I can truly escape into this dark existence.
" Josy wrote: "Steven wrote: "My husband heard about the Santino Hassell incident on public radio yesterday, and all about what's going on. Which is ama Josy wrote: "Steven wrote: "My husband heard about the Santino Hassell incident on public radio yesterday, and all about what's going on. Which is amazing, it's making the news. He only stopped to listen becaus..."
I have heard at least one person is working with a big blog/online newspaper to get this out. Not sure if I can mention who, but they're closely involved. Sharing that it's been on the radio would definitely get some attention. Also hitting up big name authors/bloggers, anyone who might share the story. I've contacted more YouTubers, a few authors with huge followings, but it will take a lot of tenacity to make sure this isn't forgotten in a week. Some people are still calling it the 'author drama' going on now. *rme* ...more "
We’d love your help. 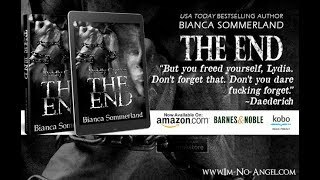 Let us know what’s wrong with this preview of The End by Bianca Sommerland. We’d love your help. Let us know what’s wrong with this preview of Inversion by Bianca Sommerland. We’d love your help. Let us know what’s wrong with this preview of Diminished by Bianca Sommerland. Pick your number 1 favourite Author. Don't forget the other 2 polls for this category. Is Breakaway going to be available at B&N for Nook soon? Looking forward to reading it soon! Hi Bianca, thanks so much for accepting my request! Nice to see you here on Goodreads! Thanks for adding me. I'm looking forward to getting to know you better over here. Congrats again on your book! Blak wrote: "Hi Bianca! Thanks for adding me! :D Love the profile pic!" You're welcome and thank you! LOL. Do I have you on facebook? Hi Bianca! Thanks for adding me! :D Love the profile pic! Sloan wrote: "Hi Bianca! Nice to see you on Goodreads. Thanks for the friend request." Hi Bianca! Nice to see you on Goodreads. Thanks for the friend request.